LASSO stands for Lionel's additive synthesis simple organ. It is my attempt at creating a sound similar to the sound of the Hammond B3 organ. - When I have started to fix my GEM H300 (also a WIP), the sound coming from the embedded Leslie was asking "why don't you try to mimic the real B3 sound?". - I have been playing with homemade electronic synthesizers for years, and I intend to keep on experimenting. - I would be really happy (if not more) to build my own drawbar organ. Right now, LASSO is no more than my other synth attempts: It is neither a working organ, nor a standalone keyboard. It may be a never ending project. Right now, it is a mix of Octave scripts and C code (not available). It is based on a thorough study of the original Hammond patents, on the schematics and on the available technical documents, such as service manuals. It is a bottom-up approach (I started from scratch in January 2006) relying upon my favorite method to generate a sine wave, the direct digital synthesis method or DDS. Everything evolves quite quickly, so I intend to put some sound samples here. For more information, you can have a look at the french forum devoted to tonewheels organ, Le bistrot des roufonistes. My nickname on this forum is leTigreBleu (more on this here). For the sake of quality, I will use the flac audio format (free lossless audio codec). Many audio players, on various platforms, currently accept this format. I also provide the original wav files, zipped. 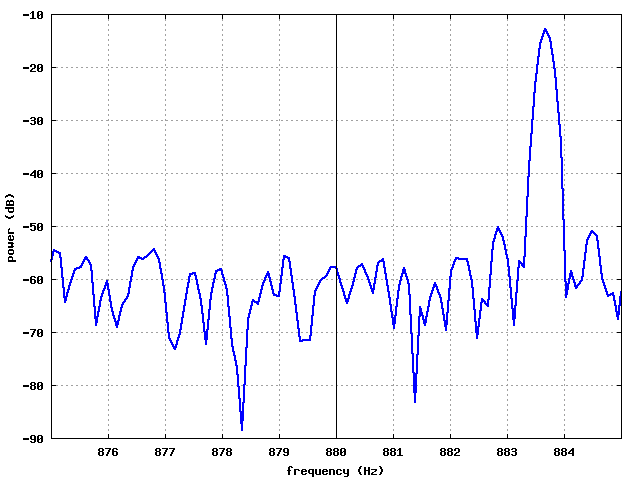 After more than two years, I am back on the very same subject: the simulation of the B3 signal. The method is, this time, different: I will spend my time analysing signals from a real B3, instead of working only from patents and technical documents. 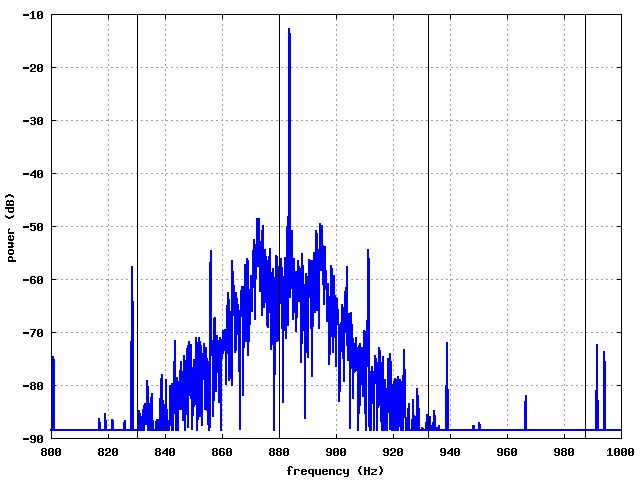 I have been kindly provided with a 96 kHz, 24 bits sample of a real B3 signal (without Leslie, as I wanted for ages). Thank you to the generous donator of the very valuable signal. Now, I am using Octave to process the signal, so as to clearly understand what a tonewheel signal is made of. I will focus on the A440 (440 Hz) and on the A880 (880 Hz). First of all, it is not a pure sine wave (not at all). You can see for yourself on the figures below that the power spectrum, computed with fast Fourier transforms and a Blackman window, is quite... well, let's say full of interesting signals! Après plus de deux ans, je reviens sur le même sujet : la simulation du signal du B3. Cette fois, la méthode est différente : je vais analyser un signal issu d'un vrai B3, au lieu de travailler à partir de brevets et de documents techniques. J'ai eu la chance d'obtenir d'un musicien sympathique un enregistrement à 96 kHz et en 24 bits d'un vrai B3 (sans Leslie, comme je le souhaitais depuis un temps fou). Merci au généreux donateur du signal. J'utilise maintenant Octave pour traiter le signal, histoire de voir de quoi un signal de roue phonique est fait. Je travaille sur le la à 440 Hz (et sur le la à 880 Hz). Bon, ce n'est pas une sinusoïde bien pure. Vous pouvez voir ci-dessous des spectres calculés par transformée de Fourier rapide avec une fenêtre de Blackman. C'est... plein de monde ! The wav file of the Hammond B3 sample at 440 Hz is available for download, for you to analyse it. The blue curve is the real power spectrum. 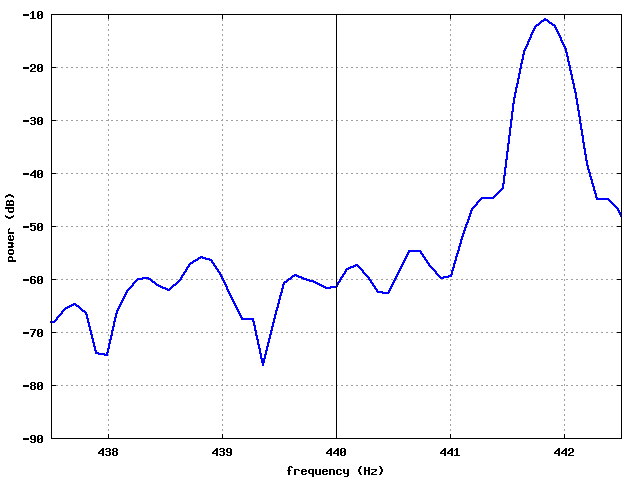 It has a peak near 440 Hz. Le fichier wav contenant l'échantillon à 440 Hz du Hammond B3 est disponible en téléchargement ici pour analyse. La courbe en bleu est le spectre du signal. Elle présente un maximum vers 440 Hz. Now, the vertical, black lines are the theoretical frequencies of the tonewheels. A closer look. Strange, isn't it? Les lignes noires verticales sont les fréquences théoriques des roues phoniques. On s'approche. Quelque chose vous surprend ? I cannot explain this. 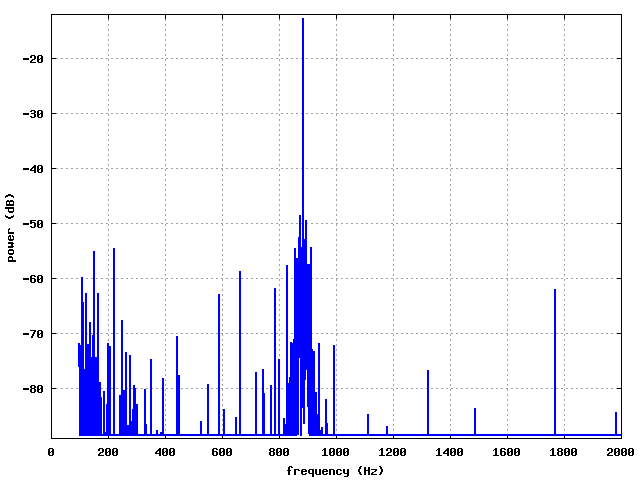 I thought the frequency would be, according to the various gears, exactly 440 Hz. 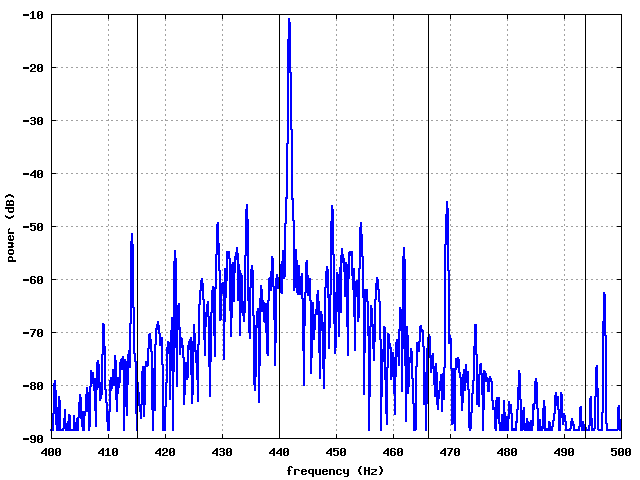 It does not seem to be the case: the maximum is at 441.8 Hz, which means it is biased. Any explaination? Je n'arrive pas à expliquer cela. Je croyais que le la serait exactement à 440 Hz, d'après les rapports de réduction des pignons. Cela ne semble pas être le cas : je trouve 441,8 Hz, ce qui veut dire qu'il y a un biais sur la fréquence. Quelqu'un a-t-il une explication ? 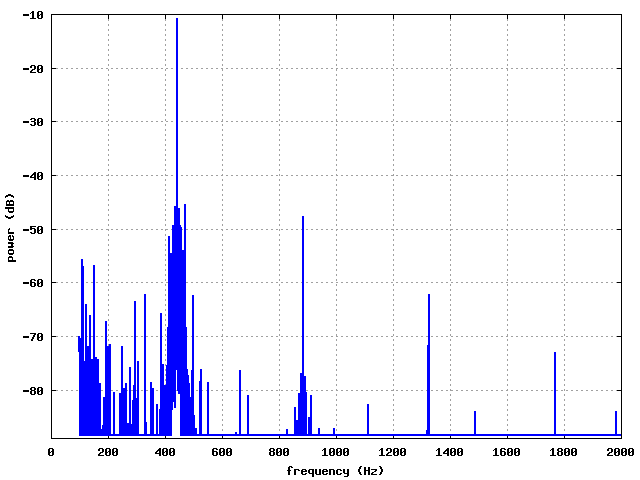 In case this is specific to the 440 Hz, I have also analyzed the next octave frequency, which sloud be 880 Hz. Have a look! The Hammond B3 sample for 880 Hz is avaible for download here as a wav file. Des fois que ce soit un problème spécifique au 440 Hz, j'ai aussi analysé le la une octave plus haut, donc à 880 Hz (en théorie). Le fichier wav contenant l'échantillon à 880 Hz du Hammond B3 est disponible en téléchargement ici. All files are supposed to be the voltage at the G-G output. All files are based upon MIDI files from the bistrot des roufonistes (Midi files). One is from Bruno Micheli ("blues suedois"), the other from Romain ("ONIONS"). The same settings were used for the two manuals: drawbar 8886, percusion 2nd, fast, normal volume for one track, and 00443 for the other track. I did not use the bass track of ONIONS, as I only have two lasso generators running on my poor old Pentium 3 (along with the midi sequencer, and the wave recorder). The files are in ogg format and in mp3 (they are quite big, i.e. greater than 1 MB). LAME 3.96.1 was used to encode in mp3, while oggenc 1.01 was used for the ogg files. All files are supposed to be the voltage at the G-G output. All files are based upon the same sequence of notes. Note that the files starting with D000P do not have a sustained tone, so as to ease percussion listening.